Johnson & Johnson (JNJ) will report their Q41 results tomorrow before the open. The options market is implying about a $4.10, or about a 3% move in either direction between now and next Thursday’s close. Prior to Reuter’s suggestion in December that the company knew for decades that its baby powder contained asbestos, JNJ was making new all-time highs, showing relative outperformance to the broad market. 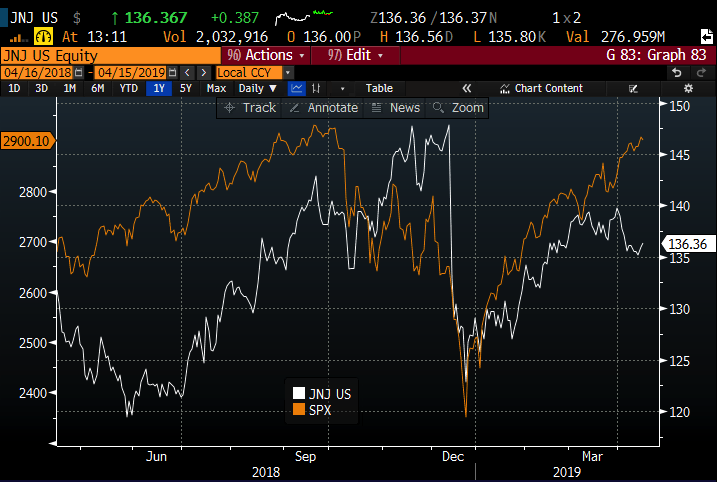 While the stock has recovered 13% from its December lows, it has lagged the S&P 500″s (SPX) 22% gain during the same period and is still down nearly 9% from its all-time highs while the SPX is within 1%. approval for erdafitnib as well. However, we look for greater visibility in JNJ’s ability to turn around its Medical Devices and Consumer segments, especially considering the recent newsflow surrounding them. Shares of JNJ trade at its lowest P/E multiple in a few years, trading a little less than 15x expected 2019 eps growth of 5% on a 1% yoy sales decline. The company has a pristine balance sheet with $20 billion in cash and $30 billion in debt on a market capitalization of $363 Billion. Despite that Wall Street analysts remain very mixed on the stock with 11 Buys, 10 Holds and 1 Sell rating. Some bulls might think the company is underleveraged and at the very least might consider adding to the share repurchase (which they last added $5 billion to in mid-December). Literally, the ‘jury is still out” on their talc lawsuits, with some states finding’s in favor of the class while other states like New Jersey have ruled in JNJ’s favor. This overhang will likely persist for some time and could hamper their M&A prospects and their buyback ability. What’s the trade? For those with a directional inclination over the next couple months, possibly a move back towards the prior highs, or down towards the 52-week lows, short-dated options prices look attractive. Profits of up to 12.30 between 132.30 and 120 with max gain of 12.30 at 120 or lower. Rationale: This trade idea risks 2% of the stock price over the next two months, which includes tomorrow’s earnings event, offering a break-even down 3% from the current price while offering profit potential of up to 9% if the stock is down 12% in the next two months. 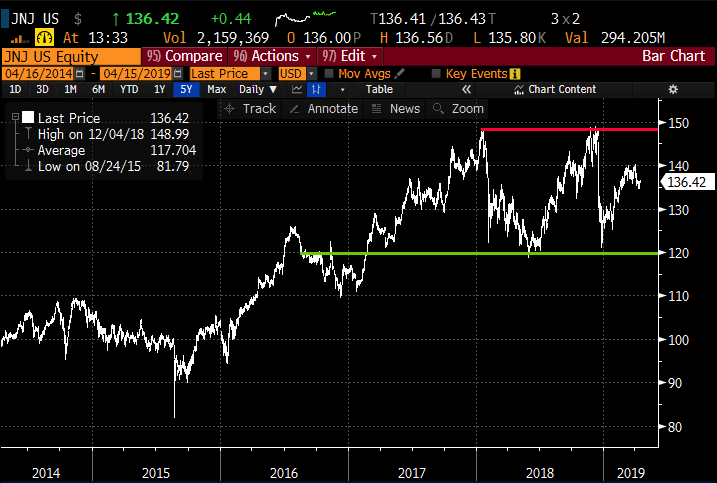 Rationale: this trade idea risks less than 1% of the stock price, offering a payout of up to 4x the premium at risk, but the trade-off is that the break-even at 141 is up 3.3% while the max payout is up 6% from the current stock price. The risk-reward is just ok, but if you get the direction and the magnitude of the move right this could be the right way to play, especially considering the stock was $140 just two weeks ago.